Quick shout out for an exciting auction that’s happening now over on ebay, one that’s in a great cause too. 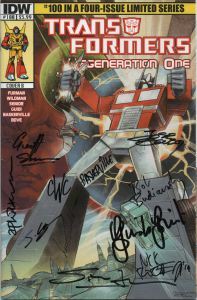 Up for grabs are copies of Transformers: Regeneration One #100, signed by a veritable host of Transformers creators. All monies raised will go to the care of writer Bill Mantlo, who was involved in an accident, suffering both physical and mental injuries, and left in need of constant care. As Transformers fans know, Bill was one of the first people involved in the comic, and also the creator of Rocket Raccoon and many more. You can check out the auctions here. SCREAM AND SCREAM AGAIN – AGAIN! Those wonderful people at Hibernia Comics have just summoned up (from some infernal pit no doubt) another spine-tingling collection of stories from the late and oh-so lamented Scream! comic (the brutally short-lived ‘creepy’ comic published by IPC back in 1984). This time it’s the turn of Library of Death, a portmanteau collection of short horror stories from the cream of British (and European) comics creators… and me. 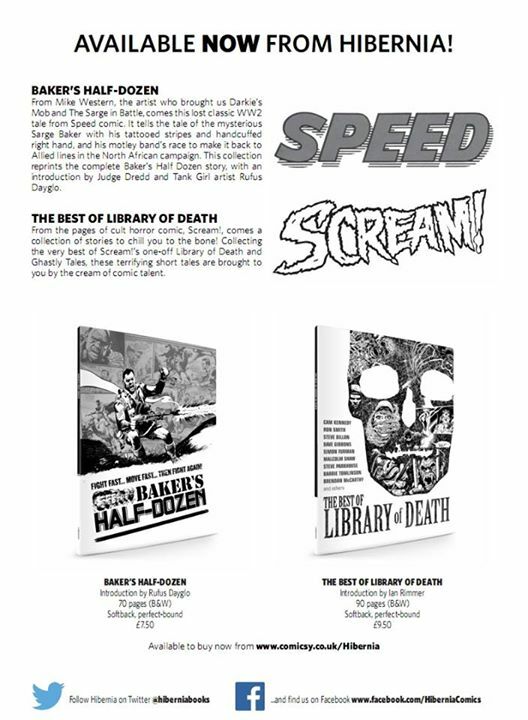 The collection features all the Library of Death stories from the fifteen issues of Scream! and various Holiday Specials, plus rare shorts like Ghastly Tales, Tales of the Nightcomer and more. The array of talent is nothing short of spectacular, with art from Dave Gibbons, Steve Dillon, Steve Parkhouse, Brendan McCarthy, Ron Smith, Cam Kennedy and many more. Of special note (to this blog at least) are a very early story drawn by Geoff Senior (Castle of Death), that almost certainly predates his work on Transformers, and some of my earliest script work (including the very first bit of text to roll off my manual typewriter, Beware the Werewolf, drawn by Steve Dillon). It’s a sumptuous collection of very rare and hard to find material – so treat yourself to a chill and dive in. You can order it from the Hibernia site here. You are currently browsing the simon furman blog archives for December, 2014.